James Campbell Noble RSA (1846-1913) was born in Edinburgh in 1846 and was the cousin of the painter Robert Noble RSA (1857-1917) who was his teacher. He travelled throughout Europe to paint and the Netherlands and Italy were his favorites. Initially, he began with rustic genre such as dark cottages and outside life. 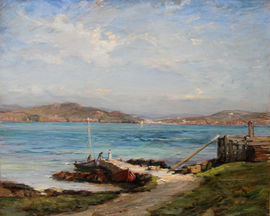 Then, when he became a member of ARSA in 1879 and the Royal Scottish Academy in 1892, he abandoned the previous subject for land- and seascape scenery and marine paintings of rivers and ports. He painted the scenery on the Clyde, Seine, Tyne, Merwede, Maas (Meus) and Rhine. For a long part of his live he actually lived in the Netherlands where his favorite port for painting seemed to have been Dordrecht, Dort for short. There are quite a number of his oil paintings painted in this harbour vacinity, which also seem to have attracted other painters. However he also painted in places like-Gravendeel, Volendam and Zaandam. In the early 1880s he painted the rocky coastal scenes of Berwickshire whilst he was living in Coldingham. He returned to the Netherlands in 1900 painting the Dutch waterways again. Towards the end of his life he moved again to Scotland, where he lived in Dumfries and Galloway and where he is also mentioned in Corstorphine in 1896. 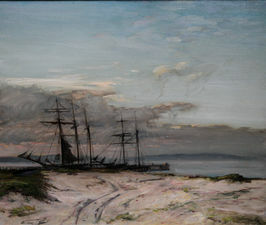 His Sunset near Glencaple was exhibited at Royal Scottish Academy in 1913. His portrait was painted by the well known portrait painter John Pettie and is exhibited in the Scottish National Portrait Gallery in Edinburgh. He died on 25 September 1913 in Ledaig, Argyll.